A patent (/ˈpætənt/ or /ˈpeɪtənt/) is a set of exclusive rights granted by a sovereign state to an inventor or assignee for a limited period of time in exchange for detailed public disclosure of an invention. An invention is a solution to a specific technological problem and is a product or a process. :17 Patents are a form of intellectual property. Under the World Trade Organization's (WTO) Agreement on Trade-Related Aspects of Intellectual Property Rights, patents should be available in WTO member states for any invention, in all fields of technology, and the term of protection available should be a minimum of twenty years. Nevertheless, there are variations on what is patentable subject matter from country to country. The word patent originates from the Latin patere, which means "to lay open" (i.e., to make available for public inspection). More directly, it is a shortened version of the term letters patent, which was a royal decree granting exclusive rights to a person, predating the modern patent system. Similar grants included land patents, which were land grants by early state governments in the USA, and printing patents, a precursor of modern copyright. In modern usage, the term patent usually refers to the right granted to anyone who invents any new, useful, and non-obvious process, machine, article of manufacture, or composition of matter. Some other types of intellectual property rights are also called patents in some jurisdictions: industrial design rights are called design patents in the US, plant breeders' rights are sometimes called plant patents, and utility models and Gebrauchsmuster are sometimes called petty patents or innovation patents. Although there is some evidence that some form of patent rights was recognized in Ancient Greece in the Greek city of Sybaris, the first statutory patent system is generally regarded to be the Venetian Patent Statute of 1450. Patents were systematically granted in Venice as of 1450, where they issued a decree by which new and inventive devices had to be communicated to the Republic in order to obtain legal protection against potential infringers. The period of protection was 10 years. These were mostly in the field of glass making. As Venetians emigrated, they sought similar patent protection in their new homes. This led to the diffusion of patent systems to other countries. In most jurisdictions, there are ways for third parties to challenge the validity of an allowed or issued patent at the national patent office; these are called opposition proceedings. It is also possible to challenge the validity of a patent in court. In either case, the challenging party tries to prove that the patent should never have been granted. There are several grounds for challenges: the claimed subject matter is not patentable subject matter at all; the claimed subject matter was actually not new, or was obvious to experts in the field, at the time the application was filed; or that the some kind of fraud was committed during prosecution with regard to listing of inventors, representations about when discoveries were made, etc. Patents can be found to be invalid in whole or in part for any of these reasons. Patent infringement occurs when a third party, without authorization from the patentee, makes, uses, or sells a patented invention. Patents, however, are enforced on a nation by nation basis. The making of an item in China, for example, that would infringe a U.S. patent, would not constitute infringement under US patent law unless the item were imported into the US. An accused infringer has the right to challenge the validity of the patent allegedly being infringed in a countersuit. A patent can be found invalid on grounds described in the relevant patent laws, which vary between countries. Often, the grounds are a subset of requirements for patentability in the relevant country. Although an infringer is generally free to rely on any available ground of invalidity (such as a prior publication, for example), some countries have sanctions to prevent the same validity questions being relitigated. An example is the UK Certificate of contested validity. 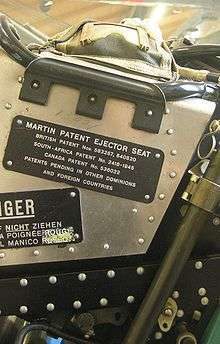 The plate of the Martin ejector seat of a military aircraft, stating that the design is covered by multiple patents in Britain, South Africa, Canada and "others". Dübendorf Museum of Military Aviation. In addition, there are international treaty procedures, such as the procedures under the European Patent Convention (EPC) [constituting the European Patent Organisation (EPOrg)], that centralize some portion of the filing and examination procedure. Similar arrangements exist among the member states of ARIPO and OAPI, the analogous treaties among African countries, and the nine CIS member states that have formed the Eurasian Patent Organization. A key international convention relating to patents is the Paris Convention for the Protection of Industrial Property, initially signed in 1883. The Paris Convention sets out a range of basic rules relating to patents, and although the convention does not have direct legal effect in all national jurisdictions, the principles of the convention are incorporated into all notable current patent systems. The most significant aspect of the convention is the provision of the right to claim priority: filing an application in any one member state of the Paris Convention preserves the right for one year to file in any other member state, and receive the benefit of the original filing date. Another key treaty is the Patent Cooperation Treaty (PCT), administered by WIPO and covering more than 140 countries. The Patent Cooperation Treaty provides a unified procedure for filing patent applications to protect inventions in each of its contracting states. A patent application filed under the PCT is called an international application, or PCT application. A trade secret is information that is intentionally kept confidential and that provides a competitive advantage to its possessor. Trade secrets are protected by nondisclosure agreements and employment law, each of which prevents information leaks such as breaches of confidentiality and corporate espionage. Compared to patents, the advantages of trade secrets are that the value of a trade secret continues until it is made public, whereas a patent is only in force for a specified time, after which others may freely copy the invention; does not require payment of fees to governmental agencies or filing paperwork; has an immediate effect; and does not require any disclosure of information to the public. The key disadvantage of a trade secret is its vulnerability to reverse engineering. Patents provide incentives for economically efficient research and development (R&D). A study conducted annually by the IPTS shows that the 2,000 largest global companies invested more than 430 billion euros in 2008 in their R&D departments. If the investments can be considered as inputs of R&D, real products and patents are the outputs. Based on these groups, a project named Corporate Invention Board, had measured and analyzed the patent portfolios to produce an original picture of their technological profiles. Supporters of patents argue that without patent protection, R&D spending would be significantly less or eliminated altogether, limiting the possibility of technological advances or breakthroughs. Corporations would be much more conservative about the R&D investments they made, as third parties would be free to exploit any developments. This second justification is closely related to the basic ideas underlying traditional property rights. Specifically, "[t]he patent internalizes the externality by giving the [inventor] a property right over its invention." A 2008 study by Yi Quan of Kellogg School of Management showed that countries instituting patent protection on pharmecuticals did not necessarily have an increase in domestic pharmaceutical innovation. Only countries with "higher levels of economic development, educational attainment, and economic freedom" showed an increase. There also appeared to be an optimal level of patent protection that increased domestic innovation. In accordance with the original definition of the term "patent", patents are intended to facilitate and encourage disclosure of innovations into the public domain for the common good. Thus patenting can be viewed as contributing to open hardware after an embargo period (usually of 20 years). If inventors did not have the legal protection of patents, in many cases, they might prefer or tend to keep their inventions secret (e.g. keep trade secrets). Awarding patents generally makes the details of new technology publicly available, for exploitation by anyone after the patent expires, or for further improvement by other inventors. Furthermore, when a patent's term has expired, the public record ensures that the patentee's invention is not lost to humanity. Another effect of modern patent usage is to both enable and incentivize competitors to design around (or to "invent around" according to R S Praveen Raj) the patented invention. This may promote healthy competition among manufacturers, resulting in gradual improvements of the technology base. This may help augment national economies and confer better living standards to the citizens. The 1970 Indian Patent Act allowed the Indian pharmaceutical industry to develop local technological capabilities in this industry. This act coincided with the transformation of India from a bulk importer of pharmaceutical drugs to a leading exporter. The rapid evolution of Indian pharmaceutical industry since the mid-1970s highlights the fact that the design of the patent act was instrumental in building local capabilities even in a developing country like India. Rent seeking by owners of pharmaceutical patents have also been a particular focus of criticism, as the high prices they enable puts life-saving drugs out of reach of many people. Boldrin and Levine conclude "Our preferred policy solution is to abolish patents entirely and to find other legislative instruments, less open to lobbying and rent seeking, to foster innovation when there is clear evidence that laissez-faire undersupplies it." Abolishing patents may be politically challenging in some countries, however, as the primary economic theories supporting patent law hold that inventors and innovators need patents to recoup the costs associated with research, inventing, and commercializing; this reasoning is weakened if the new technologies decrease these costs. A 2016 paper argued for substantial weakening of patents because current technologies (e.g. 3-D printing, cloud computing, synthetic biology, etc.) have reduced the cost of innovation. Patent critic, Joseph E. Stiglitz has proposed Prizes as an alternative to patents in order to further advance solutions to global problems such as AIDS. Several authors have argued for developing defensive prior art to prevent patenting based on obviousness using lists  or algorithms. For example, a Professor of Law at the University of North Carolina, has demonstrated a method to protect DNA research., which could can apply to other technology. Chin wrote an algorithm to generate 11 million "obvious" nucleotide sequences to count as prior art and his algorithmic approach has already proven effective at anticipating prior art against oligonucleotide composition claims filed since his publication of the list and has been cited by the U.S. patent office a number of times. More recently, Joshua Pearce developed an open-source algorithm for identifying prior art for 3-D printing materials to make such materials obvious by patent standards. As the 3-D printing community is already grappling with legal issues, this development was hotly debated in the technical press. Chin made the same algorithem-based obvious argument in DNA probes. 1 2 Lemley, Mark A.; Shapiro, Carl (2005). "Probabilistic Patents". Journal of Economic Perspectives, Stanford Law and Economics Olin Working Paper No. 288. 19: 75. doi:10.2139/ssrn.567883. ↑ Article 27.1. of the TRIPs Agreement. 1 2 Article 33 of the Agreement on Trade-Related Aspects of Intellectual Property Rights (TRIPS). ↑ "1502 Definition of a Design [R-08.2012]". Manual of Patent Examining Procedure. USPTO. Retrieved 7 January 2015. ↑ "General Information About 35 U.S.C. 161 Plant Patents". USPTO. Retrieved 7 January 2015. ↑ Charles Anthon, A Classical Dictionary: Containing An Account of the Principal Proper Names Mentioned in Ancient Authors, And Intended To Elucidate All The Important Points Connected With The Geography, History, Biography, Mythology, And Fine Arts Of The Greeks And Romans Together With An Account Of Coins, Weights, And Measures, With Tabular Values Of The Same, Harper & Bros, 1841, page 1273. ↑ "Wolfgang-Pfaller.de: Patentgesetz von Venedig" (in German and Italian). ↑ M. Frumkin, "The Origin of Patents", Journal of the Patent Office Society, March 1945, Vol. XXVII, No. 3, pp 143 et Seq. 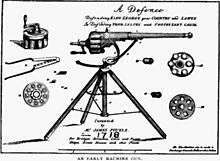 ↑ "The 18th century". Intellectual Property Office. ↑ "History of Copyright". UK Intellectual Property Office. 2006. Retrieved 2007-08-12. ↑ James W. Cortada, "Rise of the knowledge worker, Volume 8 of Resources for the knowledge-based economy", Knowledge Reader Series, Butterworth-Heinemann, 1998, p. 141, ISBN 0-7506-7058-4, ISBN 978-0-7506-7058-6. ↑ "U.S. Patent Activity 1790 to the Present". USPTO . ↑ Online at Library of Congress: "A Century of Lawmaking for a New Nation: U.S. Congressional Documents and Debates, 1774 - 1875": First Congress, Session II, chapter VII, 1790: "An Act to Promote the Progress of Useful Arts". ↑ Ford, Roger Allan. "Patent Invalidity Versus Noninfringement" (PDF). Cornell Law Review. 99 (1): 71–128. ↑ Silverman, Arnold B. (1990). "Evaluating the Validity of a United States Patent". JOM. 42 (7): 46. ↑ Mallor, Jane. BUSINESS LAW: THE ETHICAL, GLOBAL, AND E-COMMERCE ENVIRONMENT (15th ed.). McGraw-Hill/Irwin. p. 266. ISBN 978-0-07-352498-6. ↑ DLA Piper Rudnick Gray Cary (2005). "Patent Litigation across Europe". cecollect.com. ↑ "Assignee (Company) Name". Help Page. U.S. Patent and Trademark Office (USPTO). Retrieved 2007-07-25. ↑ Article 28.2 TRIPs: "Patent owners shall also have the right to assign, or transfer by succession, the patent and to conclude licensing contracts.". ↑ United Kingdom law requiring no explicit authority due to the Supremacy of Parliament. ↑ "What does 'patent pending' mean?". Archived from the original on 29 August 2011. ↑ USPTO web site, Patent Marking and "Patent Pending" (Excerpted from General Information Concerning Patents print brochure), Consulted on August 5, 2009. ↑ UK Intellectual Property Office web site, Display your rights, (under "IPO Home> Types of IP> Patents> Managing your patents> Using and enforcing") Consulted on August 5, 2009. ↑ With the following assumptions: "18 pages (11 pages description, 3 pages claims, 4 pages drawings), 10 claims, patent validated in 6 countries (Germany, United Kingdom, France, Italy, Spain, Switzerland), excl. in-house preparation costs for the patentee" (the costs relate to European patents granted in 2002/2003), in European Patent Office, The cost of a sample European patent – new estimates, 2005, p. 1. ↑ Bessen, James; Meurer, Michael James (2008). Patent failure: how judges, bureaucrats, and lawyers put innovators at risk. p. 132. ISBN 0-691-13491-X. . Based on an American Intellectual Property Law Association (AIPLA) survey of patent lawyers (2005), and court documents for a sample of 89 court cases where one side was ordered to pay the other side's legal fees.The containing chapter ('The Costs of Disputes') also tries to quantify associated business costs. 1 2 3 4 Klinkert, Friedrich (April 2012). The Misappropriation of Trade Secrets in Germany and U.S. Discovery Aid. MIPLC Lecture Series. p. 6. Retrieved May 6, 2012. 1 2 3 Howard T. Markey (chief judge of the United States Court of Customs and Patent Appeals and later of the Court of Appeals for the Federal Circuit), Special Problems in Patent Cases, 66 F.R.D. 529, 1975. 1 2 Olson, D.S., 2009. Taking the Utilitarian Basis for Patent Law Seriously: The Case for Restricting Patentable Subject Matter. Temple Law Review, 82(1). ↑ Stack, Alexander James (2011-01-01). International Patent Law: Cooperation, Harmonization, and an Institutional Analysis of WIPO and the WTO. Edward Elgar Publishing. ISBN 9781849806091. ↑ Qian, Y., 2007. Do national patent laws stimulate domestic innovation in a global patenting environment? A cross-country analysis of pharmaceutical patent protection, 1978-2002. The Review of Economics and Statistics, 89(3), pp.436-453. ↑ Pooley, J. and Westman, D.P., 1997. Trade secrets. Law Journal Seminars-Press. ↑ Kim, Linsui (2002). "Technology Transfer and Intellectual Property Rights: Lessons from Korea's Experience". Unctad/ictsd. UNCTAD/ICTSD Working Paper. ↑ Kumar, Nagesh (2002). "Intellectual Property Rights, Technology, and Economic Development: Experience of East Asian Countries". RIS Discussion Paper. 25. ↑ Kinsella, N.S., 2001. Against Intellectual Property. Journal of Libertarian Studies, 15(2), pp.1–53. ↑ Kinsella, S., 2013. The Case Against Intellectual Property. In Handbook of the Philosophical Foundations of Business Ethics. Dordrecht: Springer Netherlands, pp. 1325–1357. ↑ Lemley, M.A. and Shapiro, C., 2005. Probabilistic patents. The Journal of Economic Perspectives, 19(2), pp.75-98. ↑ Miller, S.P., 2013. Where's the Innovation: An Analysis of the Quantity and Qualities of Anticipated and Obvious Patents. Va. JL & Tech., 18, p.1. ↑ McCall, D.D., 2003. Stating the Obvious: Patents and Biological Material. U. Ill. JL Tech. & Pol'y, p.239. ↑ Heller, Michael; Eisenberg, Sue (May 1, 1998). "Can Patents Deter Innovation? The Anticommons in Biomedical Research". Science. 280 (5364): 698–701. doi:10.1126/science.280.5364.698. PMID 9563938. ↑ Outterson, K., 2005. Vanishing Public Domain: Antibiotic Resistance, Pharmaceutical Innovation and Intellectual Property Law, The. U. Pitt. L. Rev., 67, p.67. ↑ Joel, D., 2009. Pools, thickets and Open Source Nanotechnology. European intellectual property review, 31, pp.300–306. ↑ Shapiro, Carl (2001). "Navigating the Patent Thicket: Cross Licenses, Patent Pools, and Standard-Setting" (PDF). In Jaffe, Adam B.; et al. Innovation Policy and the Economy. I. Cambridge: MIT Press. pp. 119–150. ISBN 0-262-60041-2. ↑ Burk D, Lemley M (2002) Is patent law technology-specific? Berkeley Technol Law J 17: 1155–1206. ↑ Magliocca, G.N., 2007. Blackberries and barnyards: Patent trolls and the perils of innovation. Notre Dame Law Review, 82, pp.1809-1838. ↑ Merges, R.P., 2010. The Trouble with Trolls: Innovation, Rent-Seeking, and Patent Law Reform. Berkeley Technology Law Journal, 24, p.1583. ↑ Allison, J.R. and Mann, R.J., 2007. Disputed Quality of Software Patents, The. Wash. UL Rev., 85, p.297. ↑ Barker, David G. (2005). "Troll or no Troll? Policing Patent Usage with an Open Post-grant Review". Duke Law & Technology Review. 9 (11). Retrieved 9 June 2013. ↑ "'Patent trolls' cost other US bodies $29bn last year, says study". BBC. June 29, 2012. ↑ Goldman, David (July 2, 2013). "Patent troll: 'I'm ethical and moral'". CNN. Archived from the original on July 6, 2013. ↑ Boldrin, M. and Levine, D.K., 2013. The case against patents. The journal of economic perspectives, 27(1), pp.3-22. ↑ Nalebuff, B.J. and Stiglitz, J.E., 1983. Prizes and incentives: towards a general theory of compensation and competition. The Bell Journal of Economics, pp.21-43. ↑ Stiglitz, J.E., 1988. Economic organization, information, and development. Handbook of development economics, 1, pp.93-160. 1 2 A. Chin.Artful prior art and the quality of DNA patents. Ala. L. Rev. 57 (2005): 975. ↑ "Tech, auto companies join forces to thwart patent trolls". Retrieved 2016-08-23.